Where to watch this historic event? 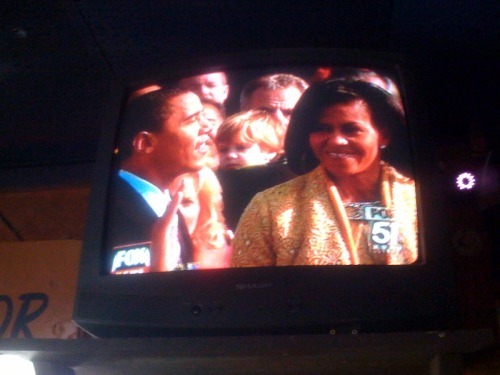 A colleague and I joined the other dining patrons at the Copper Monkey in watching the inauguration — and having lunch. I took this photo of Fox’s coverage with my iPhone and then e-mailed it to my Tumblr blog right from the booth as I ate quiche and sipped iced tea. I decided posting to the blog from lunch would be a good example to share in today’s class of how those in the media, citizen journalists and bloggers can be “reporting” with immediacy with the aid of digital technology. ← On deadline — Today was the first writing lab of the semester for my lab students. After an interview and introduction activity and a team grammar review, they were on deadline on a writing assignment.